Dating from 1950, this gentleman’s Rolex Tudor Oyster is an excellent illustrative example of a high quality vintage watch that can be purchased, even in today’s frantic market, for a modest amount of money. While not literally mint, it is in very sound condition and clearly hasn’t been abused in the past. Most importantly, it remains completely original throughout and unlike so many of the vintage Rolex Oysters for sale online, it hasn’t been cosmetically enhanced in any way. If someone had bought an automatic Tudor Oyster new in 1950 and worn it carefully ever since, they would have ended up with the item here. 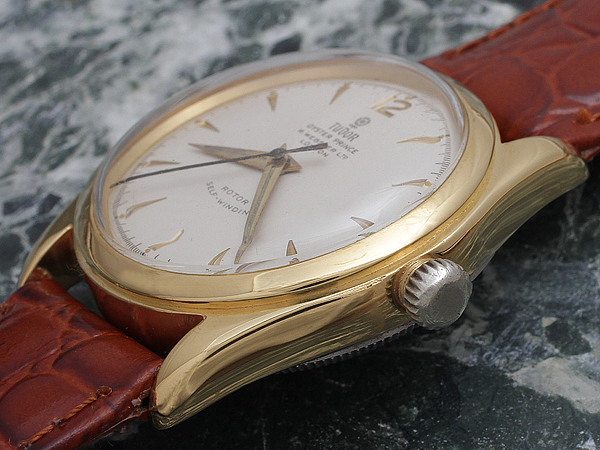 Finding good early Rolex Tudor Oysters that haven’t been modified or over-restored isn’t easy today and we were delighted when we bought this piece. Rolex introduced its Tudor range in 1945. This particular model contains one of the second generation of Tudor self-winding movements that made their debut in 1950. In the eyes of many vintage Rolex collectors, this mechanism is the finest that has ever been fitted to a Tudor model and in good order, as here, is a source of considerable pleasure when examined closely. The case front is gold plated. In contrast to the thin gold plating used on current models, the top layer on these vintage Rolex watches is far more substantial. Even after sixty years, this case is in almost mint condition. It is interesting that the case body is in brass. During the war years when supplies of raw materials were limited, a number of Swiss manufacturers used brass cases for the pilots’ watches they supplied to the British government including Jaeger LeCoultre, which adopted this approach for its famous Mark X. 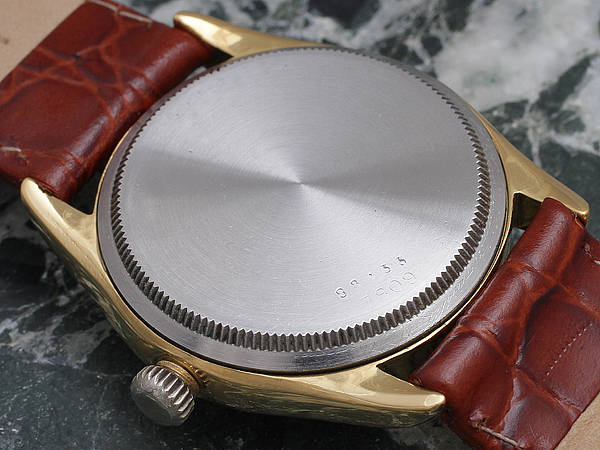 Though it isn’t something we see in current watch models today, the concept of brass for watch cases worked extremely well and they have no disadvantages over their steel equivalents. Quite correctly, the screw on Oyster case back is in stainless steel. The fine milling around the case back edges is in excellent condition and not at all chewed. This case has only ever been opened with the correct Rolex factory tool, but at some time in their lives, a lot of vintage Rolex Oysters have fallen into the hands of amateur repairers who didn’t have access to the correct tools, resulting in irreparable damage. Stamped into the case back outer are the serial number 98133 and the model reference 7809. Rolex used a different serial number sequence for its Tudor range that deviated from that used for its mainstream production, but the very early five digit number here would tie in with a watch manufactured in 1950 or early 1951. The specification of this particular watch, particularly its Oyster Patent winding crown, would suggest that 1950 is almost certainly the year that this piece left Rolex for the first time. Internally, the case back is covered with an engine turned pearled pattern. 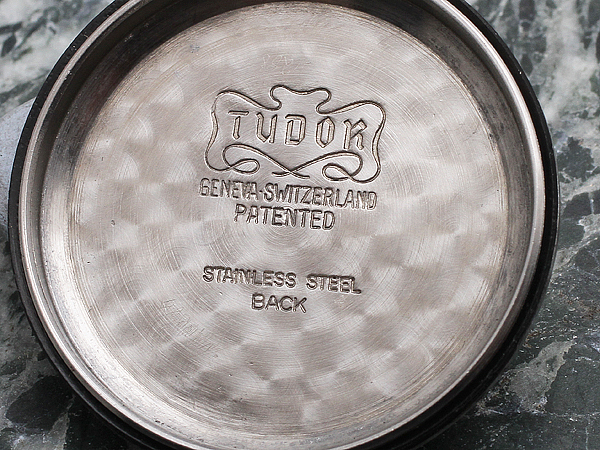 The signature “Tudor, Geneva, Switzerland, Patented, Stainless Steel Back” is as called for on the 7809. The screw down winding crown is original. This is the Oyster Patent crown that was introduced by Rolex in 1930 and is regarded by collectors as one of the all time classic variants. The wording on the flat outer surface of the crown has been virtually polished away, but is just about visible with the aid of an eyeglass. To the purist collector, it is much better to have an original winding crown, albeit it one that is somewhat worn cosmetically, than a perfect crown in a later, incorrect pattern. Here, we always cringe when we see vintage Rolex watches fitted with later, post-1953, coronet pattern, winding crowns, yet crown originality is something that is often glossed over by dealers when describing their stock to potential buyers. Both the threads inside this crown and those on the tube protruding from the case side onto which the crown screws are in excellent condition. These are not at all worn and the crown locks down tightly. The dial here is one of the best preserved that we’ve encountered on a vintage Tudor Oyster from this period, yet it remains totally original. Dials like this, which are in excellent order and untouched, are the ultimate finds for the serious collector. Most of the vintage Rolex watches for sale today are either with freshly restored dials or original dials that have deteriorated to the point where they are no longer attractive. The overall colour of this once bright white dial is just marginally creamier than it would have been in 1950, but otherwise, it really is almost impossible to fault. In order to have maximum value as collectibles, it is important that vintage wristwatches have original dials in the best possible state. Though it may sound high to novice collectors, the fact is that approximately 50% of the value of a high grade vintage watch is typically made up of its dial. Or, to put it another way, a watch with either a restored dial or a dial in poor condition will be only worth about half of the sum which the same model with a first rate dial would command. 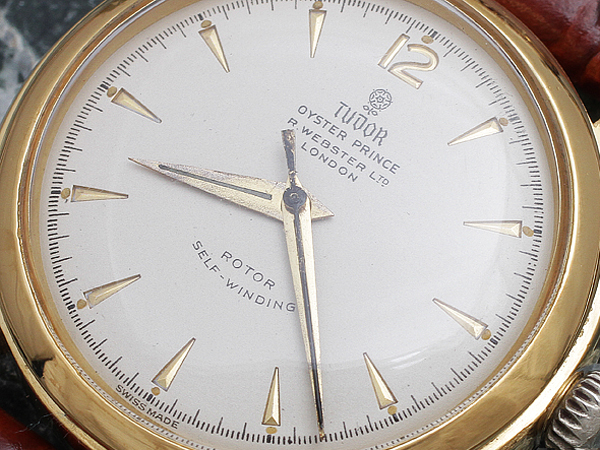 “Tudor, Oyster-Prince 34” is stated in black above the dial centre point. Beneath this is a stylised rendition of the phrase “Rotor, Self-Winding”, with the latter term in a curve below the former. This distinctive layout wasn’t just something Rolex used for the Tudor range, but also appeared on the Oyster Explorer models from the same period. There is an excellent full colour photograph on page 338 of Osvaldo Patrizzi’s book “Collecting Rolex Wristwatches 2001” which shows a 1953 Explorer, reference 6150, with the identical arced Rotor Self Winding signature. 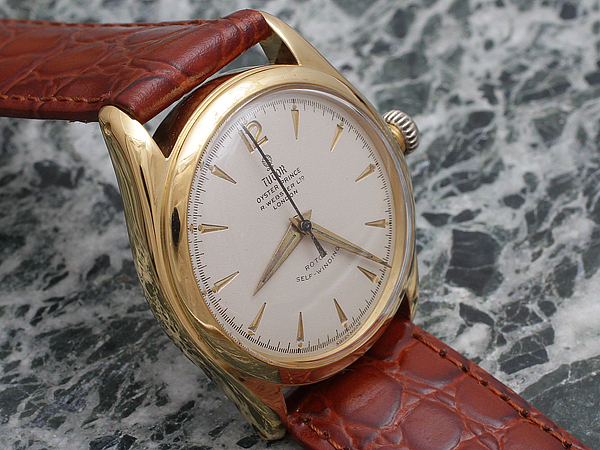 “Swiss Made” runs around the very bottom edge of the dial. More significant to the collector is the presence of the name of the Rolex agent that supplied this watch in the first instance, R. Webster Ltd of London. Double signed dials of this kind, with retailer’s names displayed alongside those of the manufacturer, are rare and desirable. They look extremely attractive and add a sense of provenance to an antique watch. Firms like Rolex and Omega didn’t double sign for all their customers and the percentage of vintage Rolex wristwatches for sale at any given point in time with original, near mint double signed dials is very small. Before moving on from this aspect of the watch, it is well worth noting that the dial construction itself is unusual on this model. Rather than being applied items that stand proud from the dial surface, the hour markers and numerals are actually behind the dial and visible through holes cut into the dial surface. This is one of the most aesthetically appealing of all the vintage Rolex dial variants, but is something we don’t often see. In our business, we’ve occasionally had Oyster Speedking models from the early 1950s with dials produced in this way, but very few others. Probably the most famous examples to use this style of pierced dial were the original Panerai models that were produced using Rolex movements for the Italian navy in the 1940s. All three hands are original to this watch. 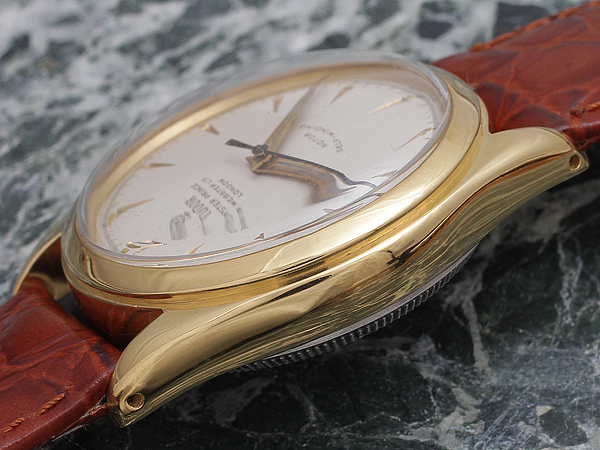 In the dauphine shape and in gilt, the hour and minute hands match the dial numerals perfectly. The second hand is in blued steel and not in the least bit corroded. When buying a vintage wristwatch, it is essential that cosmetic features like hands are correct, especially if investment potential is a reason for purchase. Finding authentic period hands to put non-original classic Rolex watches back to standard is a nightmare and we would advise our customers that it’s better to pay a little more in the first instance and buy something entirely correct rather than opting for a cheaper watch with aspects that are sub-standard and then trying to put these right at a later stage. The quality of these early Tudor movements is exceptionally high. The unit here, calibre 390, was actually a reworking of the calibre 380 mechanism supplied to Rolex by Fleurier ( FEF). The latter would ship movements in their raw, unfinished state to Rolex, which would then process them to its own exacting standards. 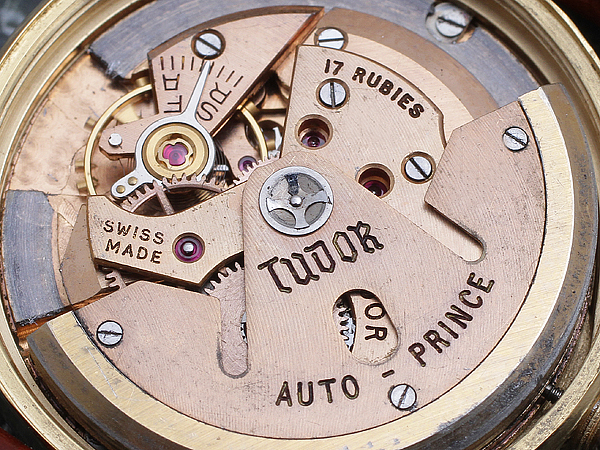 “Tudor, Auto-Prince” is signed on the rotor, with “Tudor, 17 Rubies, Swiss Made” on the rotor bridge below. Notice the similarity in appearance between this movement and the Rolex calibre 1030 from the same period. Both have the same “butterfly” cut outs in their rotors and the sprung disks of the twin click wheels. The 390 is the classic example of a vintage Tudor product that, in truth, was just as good as its mainstream Rolex equivalent, which explains why watches with this movement are so highly regarded by purists today. 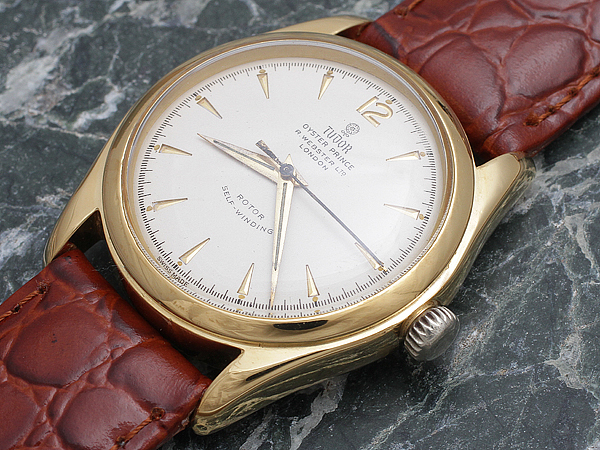 Unlike a lot of the vintage Rolex movements we see, this one is in superb condition throughout. Every aspect of this unit is original and authentic, with no non-standard parts present at all. The pink gold finish of the plates, which ironically is reminiscent of vintage movements by Omega, is free from dulling and gleams brightly. All the screw head slots are in excellent shape, without any signs of chewing, which is always a sign that watches have only been in the hands of professional repairers who knew what they were doing. This watch has obviously been well cared for. Consequently, it works perfectly and runs extremely smoothly. Vintage Rolex Oysters from this period were built to standards that would never be economically viable today and if maintained correctly, they will continue to run almost forever. When new, they were expensive items that were intended to last a lifetime and with a little thought and sensible use, they will fulfil this potential without difficulty. The price of this item is £1085 GB pounds, making it one of the least expensive vintage Rolex watches for sale on this site. It is a lovely looking, extremely well built classic model that if looked after, won’t lose a penny in value in the future. Early Rolex Tudor Oyster models that haven’t been doctored are getting thin on the ground and even two or three years from now, we predict that watches like the one here will be considerably more expensive than they are at present.